In the context of Berlioz’s career, the name ‘Germany’ is of course a convenient shorthand – in the composer’s time Germany was not a unified country but a multiplicity of separate states. Berlioz himself used the term in a broad cultural sense to include not only the various German states but also countries in central Europe – in his Memoirs he added to the title of his second ‘Travels to Germany’ the subtitle ‘Austria, Bohemia, and Hungary’, which at the time (1845-46) were parts of the Austro-Hungarian empire. These pages trace Berlioz’s long and fruitful relations with Germany over his career. The main page gives a general view, while separate pages devoted to the individual cities which Berlioz visited provide further detail. For a number of photos from cities visited by Berlioz we are indebted to our friend Pepijn van Doesburg; detailed acknowledgement is provided in the relevant pages. The text of all ‘Berlioz in Germany’ pages is our own. All English translations from Berlioz’s original texts (Memoirs, letters etc.) are by Michel Austin. Berlioz gives a detailed account of his two major trips to Germany in 1842-3 and 1845-6 in the Memoirs in the sections entitled Travels to Germany I and Travels to Germany II: Austria, Bohemia and Hungary; these were based on a series of articles he originally wrote and published in 1843-4 and 1847-8 in the Journal des Débats (see Critique musicale V, pp. 245-55, 263-307, 317-37, 347-71, 403-14 for the first series). The visit to Berlin in 1847 on his return from Russia is mentioned in the chapter of the Memoirs entitled Travels to Russia – Sequel. The other trips, especially those from 1853 onwards, were not written up in the same way, though Berlioz gave an account of the Beethoven celebrations in Bonn in August 1845 soon after which was later included in the Soirées de l’orchestre, 2nd Epilogue. He also gave a light-hearted view of his visit to Baden-Baden in August 1856 via the spa resort of Plombières, later included in the Grotesques de la musique, and another one in September 1861, later included in À travers chants. Again, as with the Memoirs, these were originally published as articles in the Journal des Débats. But the most detailed evidence comes from the many hundreds of letters of Berlioz that have survived (collected in CG); as well as covering the whole of Berlioz’s career and thus every major trip he made they have a day-to-day immediacy that the retrospective and more polished accounts in the Memoirs do not have. See the Index of letters of Berlioz cited on this site. 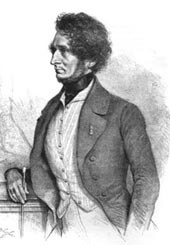 As winner of the Prix de Rome of 1830, Berlioz received a state pension for five years (from 1831 to 1835 inclusive) and was required to spend a period of study in Italy, to be followed by a further period in Germany. As is well known, the trip to Italy influenced Berlioz in many ways. But from a purely musical point of view Italy had little to offer to Berlioz and he curtailed his stay there as much as he could: he reached Rome in March 1831, but left Italy for good in June of the following year, never to return. Germany was different: initially Berlioz had every intention of spending a year there, and there were strong musical reasons for doing so. Letters of 1832 repeatedly show him planning to follow his trip to Italy with one to Germany in 1833 (Berlin specifically, where Spontini was now established). On the way there he would stop briefly in Paris in order to perform his Fantastic Symphony together with the newly-composed sequel to it, the Return to Life, later called also Lélio (CG nos. 256-8, 268, 272, 276, 282). But events took an unexpected turn: on his return to Paris Berlioz stayed coincidentally in the flat that had once been occupied by Harriet Smithson, then in Paris, and the composer’s infatuation with the Irish actress started all over again. There followed a stormy courtship during 1833 which was eventually resolved by their marriage on 3 October. In April of 1833 the administration of the Beaux-Arts had consented to Berlioz postponing his projected trip to Germany to the following year (CG no. 334). After his marriage Berlioz seriously contemplated carrying out his original plan of going to Germany during the winter, this time with Harriet (CG nos. 347, 351, 360), and on 7 December he even wrote to Spontini in Berlin asking for his support for the plan (CG no. 364). But before the end of the year the project had fallen through and was abandoned (CG no. 370, to his sister Adèle): for the foreseeable future he would have to stay in Paris to make a living and promote his career. During 1834 and 1835 Berlioz managed to receive the final instalments of his Prix de Rome pension, and the requirement to go to Germany was in practice quietly dropped. But for Berlioz the projected trip to Germany was not abandoned altogether, merely postponed, though it was going to be a long time before it could be carried out. Regardless of the requirements of the Prix de Rome, Berlioz would probably have gone to Germany sooner or later: though his roots were in France, his musical debts to Germany were by his own admission immense. From early in his career he knew that Germany as a country was the real centre of gravity of the musical world, however strong the bonds that kept him tied to Paris throughout his life. Almost from the moment of his arrival in Paris Berlioz was exposed to the music of German composers: first Gluck at the Opéra (November 1821), to be followed by Weber (late in 1824), finally and most important Beethoven (1828). The European cultural and musical scene had long been cosmopolitan: composers and musicians travelled freely. Decades before Berlioz, Gluck’s career had spanned a large part of Europe – Prague, Vienna, many cities in Germany and Italy, Paris, London, Copenhagen. Weber stopped briefly in Paris in 1826 on his way to London where he was to die prematurely. After many years in Paris, Spontini, another of Berlioz’s idols, moved to settle in Berlin in 1820. Musicians from Germany and all over Europe flocked to Paris, the most important city in the musical world of the time, whether to perform themselves or to study at the Conservatoire. It was a contemporary German composer, Meyerbeer, who was to dominate the stage of the Paris Opéra for many years with the success of Robert le Diable (in 1831) followed by Les Huguenots (in 1836). It was in Paris in the 1820s and 1830s that Berlioz made the acquaintance of numerous performing musicians, many of them German – Ferdinand Hiller (CG nos. 156, 203, 206 etc. ), Ludwig Schlösser (CG nos. 840, 881, 895), the Pole Karol Lipinski (CG nos. 803, 807), Anton Bohrer (CG no. 809bis), Heinrich Ernst (CG nos. 1095, 1263, 1284 etc. ), the Müller brothers, and others. Some he also met during his trip to Italy in 1831-2 – among them Mendelssohn (CG nos. 804-6, 813 etc.) and Josef Dessauer (CG no. 272). Men such as these constituted a network of friends active in the musical life of the leading German cities, and they were to be of great assistance to Berlioz in his travels later – Hiller in Frankfurt, Schlösser in Darmstadt, Lipinski in Dresden, Bohrer in Hanover, the Müller brothers in Brunswick, Mendelssohn in Leipzig, Meyerbeer in Berlin, Dessauer in Vienna. Further links were created once Berlioz travelled himself to Germany (see the page Berlioz and Germany: friends and acquaintances). Among all the papers I read yesterday there are thirteen in favour and two against (le Corsaire and le Constitutionnel). Le Corsaire was not present at the ceremony as is proved by the factual errors it makes, and le Constitutionnel wanted to get its own back for an article on Hérold I wrote two years ago. Such are the inevitable benefits of being a music critic. I have sent you in two parcels about twenty papers; I imagine they have all reached you. The English press has also been very good, and so we can be confident of causing a tremendous stir in the four corners of the globe. The consequences of this overwhelming endorsement by one of the greatest musicians of all time will be incalculable, especially in Germany and England, and here in Paris I can already sense them. Early in January 1839, writing to Humbert Ferrand, he notes that newspapers in London were reporting very favourably on Paganini’s gift (CG no. 616). This new proof of the danger for me in allowing my works to circulate has made me resolve not to allow anything to be published before I have made myself the trip to Germany. Under one pretext or another my wife had always been hostile to my travel plans, and had I followed her I would still at this time not have left Paris. An insane jealousy for which I had long given no cause was at heart the reason for her opposition. To achieve my plan I had therefore to keep it secret and smuggle out of the house my bundles of music and a trunk, and leave abruptly, leaving a letter to explain my departure. But I did not leave on my own: I now had a travelling companion who since then has followed me in my various excursions. You understand that I must first go to places where I have friends such as you to pave the way and look after my interests, before I present myself in a city like Vienna where I do not know anyone and where expenses must be very high. As a result, the trip had to be improvised on an almost day to day basis to meet fluid local circumstances, and there were endless changes of plan. The start of the trip was inauspicious: planned concerts in Brussels and Frankfurt did not take place. Several projected visits were either postponed till a later trip (such as those to Breslau, Vienna and Pesth), or never materialised despite attempts in later years (such as those to Munich and Amsterdam). The timing and programme of individual concerts was subject to frequent modifications. Communication could only be done by letter or by personal contact on the spot. Tact and diplomacy were at a premium, as revealed for example by Berlioz’s correspondence with J.-C. Lobe in Weimar: Lobe suggested it would be prudent to conciliate J.-B. Chélard, a musician resident in Weimar whom Berlioz had known in Paris but had not maintained contact with for a long time, and Berlioz followed his advice (CG nos. 792, 793, 796, 798bis and ter). Travel was partly by stagecoach, and partly by the network of railways which was beginning to spread in Europe. This enabled Berlioz on one occasion to make a return journey from Leipzig to Dresden and back the same day, to his amazement (2 February 1843; CG nos. 810, 816): ‘such is the power of railways!’ he exclaims to his father (CG no. 820). One special problem was the enormous pile of manuscript music, scores and parts, weighing some 250kg in all, that had to travel around by stagecoach at considerable expense (cf. e.g. CG nos. 794, 806bis, 820, 822). It was also risky: Berlioz’s symphonies were as yet unpublished… (cf. CG 781). The costs incurred for travel and lodging at good hotels were high, and receipts from concerts often below what Berlioz had hoped. Then there was the problem of recruiting players and singers of sufficient numbers and calibre; conditions varied from place to place. Berlioz quickly found out that some instruments which he could take for granted in Paris were rarely to be found in even the best German orchestras of the time (the harp, cor anglais, and ophicleide), and the cymbals available were regularly in poor condition. Rehearsals demanded much time and patience, as the players were faced with music that was unfamiliar in style and technically difficult. While the trip was proceeding Berlioz also had to keep an eye on the Parisian musical scene: it was important that the public at home be impressed by the success of his German venture (CG nos. 795, 817, 818). On top of it all there were private worries. Marie Recio’s presence was a liability, personal and musical, but despite attempts Berlioz could not shake himself free (CG nos. 800, 815). In the background Harriet and his son were a subject of concern at home (CG nos. 815, 821). No wonder Berlioz felt the strain, and he was not the only one to suffer from the unusually mild winter: in Dresden, Leipzig and again in Brunswick he had to see a doctor (CG no. 820). The trip was too hectic to allow Berlioz any time for composition, apart from the orchestration of the song Absence for performance by Marie Recio. But musically it was for him extremely instructive: in Germany he was confronted for the first time with a different musical culture from that of Paris (the trip to Italy in 1831-2 was not comparable in this respect). Here was a land where music was taken seriously in all classes of society, and which still had an aristocracy that championed the arts. Some rulers even took a personal interest in music, such as the King of Prussia whom Berlioz later thanked for his support for musicians (Memoirs, Travels to Germany I, 9th letter; Sequel to the trip to Russia). The trip also had a practical purpose: Berlioz had received a commission from the Minister of the Interior to report on musical institutions in Germany. Before his departure he had been working on his Treatise on Orchestration, which he intended to dedicate to the King of Prussia. To study at close quarters the different instrumental traditions and practices of both countries was a matter of absorbing interest to a connoisseur like Berlioz. There is nothing in Germany that is as completely good as at the Paris Conservatoire, but there is excellence everywhere. I must even say that thanks to the attentiveness and discipline of the players at rehearsals I achieved results that were in some respects better than in Paris. In Brunswick, Hamburg and Leipzig my music was performed flawlessly, and some orchestral pieces were even played in an inspired way. On the other hand the choruses are everywhere very weak; there is a French prejudice in their favour which we must certainly revise. On his return Berlioz distilled his experiences in detail in the form of a series of open letters, addressed ostensibly to a number of friends and musical colleagues, and published initially in the Journal des Débats between August 1843 and January 1844. These were published in book form in 1844, and later incorporated in his Memoirs (Travels to Germany I, letters 1-10). As well as giving an account of his travels and concerts that is full of picturesque detail, Berlioz comments at length on German instruments and instrumental playing as compared with French practice, notably in the 7th letter (Berlin). In many respects he was full of praise for German musicians; their brass playing, especially the trumpets, he judged to be superior to that of the French. They also made common use of valve trumpets and horns, and it was in Germany that Berlioz first heard the bass tuba. But some of his comments were to cause him trouble, as he found when stopping in Berlin on his return from Russia in 1847: the Berlin flute players had taken it very badly that he placed them beneath their colleagues in Paris and they sought to rally the orchestra in their support (Memoirs, Sequel to the trip to Russia). Music is essentially aristocratic; she is a scion of noble lineage whose dowry only princes can nowadays provide; she must therefore learn to live in virgin poverty rather than marry beneath her standing. Overall Berlioz was justified in regarding the trip as a breakthrough: it won him many new friends and admirers in Germany and established him as a major figure on the international musical scene. He was now a celebrity: his name was known even to a postal worker in Magdeburg (Travels to Germany I, 10th letter)! Seeds were planted that would grow in future. One of the more picturesque moments in his trip was the brief visit to Hechingen in the Black Forest around the turn of the year 1842-3 at the invitation of the prince of Hohenzollern-Hechingen (Memoirs, Travels to Germany I, 2nd letter). Twenty years later, in April 1863, the same prince, now aged and infirm, invited Berlioz again, this time to his castle in Löwenberg in eastern Germany, to conduct the excellent court orchestra that he had assembled: Berlioz was astonished and delighted at how well they knew and played his music. I am now back from my long excursion across Germany; I am still feeling very tired as a result […] in five months I have given fourteen concerts and conducted forty-three rehearsals. Fortunately the result has been really splendid as far as my musical reputation is concerned. From the financial point of view the trip could not have been more than just satisfactory in view of the enormous cost of such an enterprise, unprecedented in musical history. This musical Odyssey has caused an extraordinary stir in the German press, and as a consequence also in newspapers in France, England and Italy. A composer travelled around Germany to put on and conduct himself concerts devoted exclusively to the performance of his own works, and this had never been seen before. The musicians greeted me everywhere with warm, devoted and touching hospitality, and I was welcomed by several princes with the most flattering eagerness […] Since my return to Paris I notice the gratifying impact in France of these successes across the Rhine. My friends are triumphant and my enemies livid; many who were indifferent have now also become champions. The impact is even being felt in England […]. Here I am now […] at the end of this pilgrimage, perhaps the most difficult ever undertaken by a musician, the memories of which will, I feel, remain for the rest of my life. Like the pious men of ancient Greece I have consulted the oracle at Delphi. Have I correctly understood the meaning of the response? Must I believe in its apparently encouraging content?… Are some oracles not misleading?… Only the future will tell. I must now go back to France and bid at last farewell to Germany, this noble second mother of all the sons of harmony. But where can I find words that express adequately my gratitude, my admiration and my regrets?… What hymn can I sing that would be worthy of her greatness and glory?… All I can do on departing is to bow respectfully and to say with emotion in my voice: Vale, Germania, alma parens! Barely back from his travels Berlioz was filled with nostalgia for the country that had welcomed him. On 12 July he writes to his sister Nanci (CG no. 843): ‘I would love to start my travels again, I would love to see all those German orchestras which I miss here all the time’. But as throughout Berlioz’s career, the gap between aspiration and practical realities was painfully large, and in the next two years Berlioz was more than usually busy in Paris. ‘Were I free I would go back to Germany and I would soon be seeing you again’, he writes to a friend from Weimar in September 1843 (CG no. 848); ‘but unfortunately I am becoming ever more like Gulliver in Lilliput, and there are thousands of invisible threads which conspire to tie me down to the same spot, I suffer for lack of air and space, and I am not able even to compose!… Strange as it may seem, it is all too true that I do not have time to be a musician’. His domestic situation was also in this period in a state of crisis, as letters of 1844 to his family reveal (CG nos. 910, 920, 923, 924). One of the tasks he attended to promptly after his return was writing up an account of his travels and experiences for the Journal des Débats (see above); the articles were widely noticed in musical Europe and within a few months translated for publication in Germany (cf. CG nos. 845, 846, 849, 853, 864, 875, 877, 881bis, 915). They may have contributed to the improvement in instrumental standards which he repeatedly noticed in his trips to Germany a decade later. A projected trip to Baden-Baden in the Black Forest for a concert in August 1844 fell through (CG nos. 881, 895, 902, 919) – Berlioz was so exhausted by his exertions in organising the great Festival of Industry concert that he had to take a period of rest at Nice in September. It was to be almost a decade before the connection with Baden-Baden would be resumed. The stimulus to resuming his German travels came in the summer of 1845 when Liszt invited him, as well as many musicians from all over Europe (CG nos. 962, 987), to the celebrations in Bonn for the inauguration of a statue in honour of Beethoven (10-12 August). Although plans for a performance of the Requiem there fell through (CG nos. 962, 969), Berlioz made contact again with many of his German friends, including the King of Prussia, now the dedicatee of the Treatise on Orchestration (CG nos. 873-4, 891bis, 902). A group of Viennese musicians was particularly insistent on inviting him to Vienna, and this decided him to go there first before carrying out a visit to Russia he had been considering for several months (CG no. 992, cf. 962). The second trip was partly a delayed completion of the first: Berlioz visited cities he had been obliged to leave out first time round (Vienna, Pesth, Breslau). It also gave him the opportunity to revisit places that had been particularly welcoming in 1843 (Brunswick). It had the same improvisatory feel: Berlioz had not planned initially to visit Prague, and was advised against it in Vienna, though it turned out to be one of the happiest and most fulfilling trips he ever made. The sensational success of the visit to Pesth was also the product of circumstances and of Berlioz’s flair for seizing opportunities. And as with the first trip, there were loose ends – Berlioz had planned to visit Munich on the way to Vienna but once more this fell through (CG no. 1001); an invitation to Bremen could not be accepted (CG no. 1036ter) and was only followed up in 1853. In other respects the second trip was different. It was less hectic, fewer cities were visited, and in most of them more than one concert was given – no less than seven in Vienna, where he stayed over two months, and six also in Prague. There were no significant setbacks on the way and Berlioz was enthusiastically received everywhere. His letters during the trip convey a sense of greater relaxation – he was even able to enjoy sightseeing (as in Prague), and the striking contrasts between the national temperaments of the various peoples he visited caught his observant eye (CG no. 1029). Although his domestic situation remained unresolved, he was now more reconciled to it; Marie Recio accompanied him on the trip, posing for the first time openly as Mme Berlioz, and Berlioz was now prepared to accept this (CG 1006, 1011, 1020bis, 1022). Most important, the trip did not prevent Berlioz from composing: already on arrival in Vienna in November he composed the boléro Zaïde. The trip acted even as a stimulus: in the autumn of 1845, after the visit to Bonn, Berlioz had started work on the composition of The Damnation of Faust, which incorporated and considerably enlarged his earlier Eight Scenes from Faust of 1828-9. Work on the new score was pursued during the trip, as he relates in the Memoirs (the Damnation is seemingly the only major score of Berlioz to have been written partly while travelling abroad). Since his chosen librettist (Almire Gandonnière, cf. CG no. 999) was not at hand, Berlioz was forced to become for the first time his own librettist and complete the text himself (CG nos. 1029, 1045, 1060). It is easy to suppose that his renewed interest in the subject was prompted in part by direct contact with the setting of the Faust legend (cf. Travels to Germany I, 3rd letter, on the literary memories stirred by the first visit to Weimar early in 1843). They even wanted to keep me in Vienna to replace the conductor of the imperial chapel [the orchestra] who died during my stay in Austria. But this would have meant abandoning France once and for all, and I must confess that for all the kindness of the Viennese and the generosity of their ruler this is an effort that was beyond me. There is only one Paris in the world: it is an electrifying city which attracts and repels in turn, but to which at the end anyone who has lived there is forced to return, especially if he is French. As with the first trip, Berlioz was assuming on his return to Paris that he would soon be on his way back to Germany and central Europe. He was particularly anxious to return to Prague where he had been so warmly received (CG nos. 1041, 1044, 1057, 1174). In practice contact was gradually lost with the friends he had made there, and a return visit sadly failed to materialise. It was not till 1852 that he was once more in Germany. The intervening years were clouded with setbacks which affected him deeply: the failure of the Damnation of Faust in Paris in December 1846, partly offset by the great success of his trip to Russia in 1847, though this was in turn overshadowed by the disappointment of his first visit to London in 1847-8 when Jullien the impresario who had invited him went bankrupt. While Berlioz was still in London revolutions broke out all over Europe in 1848, and most grievously his father died soon after Berlioz returned to Paris during the summer. The second trip to Germany was written up by Berlioz, as the first had been, for the Journal des Débats and in the same form of open letters (in the final version in the Memoirs they are all addressed to his friend Humbert Ferrand). But this time the task took longer: publication of the series only started in August 1847 and was not completed till summer of the following year, and the Revue et gazette musicale published the final articles which were originally intended for the Journal des Débats. The letters differed also from the first series in that they said less about the concerts of Berlioz’s own music, apart from the first performance of the Hungarian March in Pesth (3rd letter), and the visits to Breslau and Brunswick were not mentioned (the visit to Breslau is only mentioned at the start of chapter 54 of the Memoirs). The letters presented instead a more wide-ranging report on the state of music-making in Vienna (letters 1-2) and Prague (letters 4-6), and in the 5th letter Berlioz drew up a list of recommendations for the teaching of music at the Paris Conservatoire. The resumption of travels to Germany was linked to the activities of his friend Liszt, who in 1848 had settled in Weimar and turned it into a centre of progressive music-making. Among other contemporary works staged by Liszt was Berlioz’s Benvenuto Cellini, unperformed since its failure in Paris in 1838, and revived in 1852 in what was to become known as the Weimar version. Berlioz travelled to Weimar in November 1852 to attend a performance. In the following years he returned to Weimar on a number of occasions to give several concerts (1854-6, 1863). The visits of the 1850s were to have a profound effect on his own career, beyond the revival of Benvenuto Cellini. In 1853-4 he was encouraged to complete l’Enfance du Christ; it was an instant success in Paris and received a series of performances abroad. And it was in Weimar that Princess Carolyne-Sayn Wittgenstein eventually persuaded Berlioz in 1856 to undertake the task he had long contemplated but kept resisting – the composition of the epic opera Les Troyens. But it was also in Weimar that the seeds of the eventual disagreement between Berlioz and his old friend and champion were sown: Liszt was no less ardent in promoting the music of Wagner, and was saddened that Berlioz did not share his enthusiasm. From 1853 to 1856 Berlioz travelled every year to Germany for concert tours, some to cities he had previously visited (Brunswick, Dresden, Hanover, Leipzig, Weimar), others to new destinations (Bremen, Gotha). Generally speaking the trips were of shorter duration than the pioneering adventures of 1842-3 and 1845-6. Germany was now a regular destination where Berlioz’s music was increasingly known, performed and appreciated, and his band of devoted admirers continued to grow. On the other hand there were also signs of occasional prejudice in the German press against the French composer, as for instance concerning Berlioz’s contribution to the performances of Weber’s Der Freischütz at the Opéra in 1841 (CG nos. 1674, 1679, 1682, 1684-5), and over his treatment of the Faust legend, where even some of his German admirers did not see eye to eye with him: for example the devoted Griepenkerl in Brunswick thought Marguerite ‘was not sufficiently German, and far too passionate’ (CG nos. 1750, 2070). Then there was the crucial problem of language: whereas many German musicians did learn French (Mendelssohn and Wagner among many others), Berlioz, a very literate and literary man but not a natural linguist, never tried to learn German, and could never be entirely at home in Germany. In 1854 he was offered in Dresden, as he had been in Vienna in 1846, a permanent musical post, with the prospect of making Dresden ‘the musical capital of Germany’ (Memoirs, chapter 59). Earlier in the year the rumour had actually gone round in Paris that he had been appointed (CG no. 1692). When the offer was made Berlioz did not reject it outright (as he had done with the Viennese offer of 1846), but in the end the plan came to nothing and Berlioz remained tied to Paris for the rest of his career. The period of extensive travelling came to an end in 1856 when Berlioz committed himself to the composition of The Trojans and then to the challenge of getting the new work performed. For several years until 1863 his travels were reduced to an annual visit to Baden-Baden in the summer to conduct a concert, thanks to the initiative of the impresario Edouard Bénazet. It was Bénazet who accepted Berlioz’s last opera Beatrice and Benedict for performance in Baden-Baden, in place of the opera which he had commissioned in 1858 but which Berlioz did not write; Beatrice and Benedict received its first performance in August 1862 in the new theatre that Bénazet had built – the only major work of Berlioz to receive its first performance outside France (it was not performed in Paris in the composer’s lifetime). It was performed in April of the following year in Weimar, and again in Baden-Baden in August 1863. The year 1863 marks in practice the end of Berlioz’s active association with both Baden-Baden and Weimar, and thereafter he only made two more trips to Germany, to perform the Damnation of Faust in Vienna in December 1866, and to give a concert in Cologne in February of the following year. The story of Berlioz’s relations with Germany, in his lifetime and after his death, is long and complex, but a few posthumous landmarks may be noted. It was in Karlsruhe that took place the first complete staging of both parts of The Trojans in 1890 under Felix Mottl. Appropriately it was in Germany that the first (though flawed) attempt at a complete edition of his musical works was published (by Breitkopf and Härtel, between 1900 and 1907), and that the second and definitive publication was launched in 1967 (by Bärenreiter) to celebrate the centenary of the composer’s death (1969), an undertaking that was nearing completion at the time of the bicentenary of the composer’s birth in 2003 and was eventually completed in 2006. A separate page is devoted to every city in Germany and central Europe visited by Berlioz and where (in most cases) he gave one or more concerts. The list, which for convenience includes also cities outside Germany but which formed part of the same musical travels (Brussels, Pesth, Prague, Riga), is in alphabetical order. Berlioz in Germany was created on 1 February 2005. © Michel Austin and Monir Tayeb.